The Guardian‘s n0tice project launched last year as an experimental new way of sharing local news and community events. Now the platform behind it is being opened up as a toolkit that publishers, brands, communities and developers can use as part of their own open journalism projects. As a recap, n0tice broke cover in October last year as essentially a lean startup within the Guardian. The service is an online community noticeboard, onto which news, details of events, and local special offers can be posted for other users. After a closed beta period, it opened to all in March. We see it as a strong hint at the future of local news, offering a compelling alternative to the slowly dying local newspaper model. 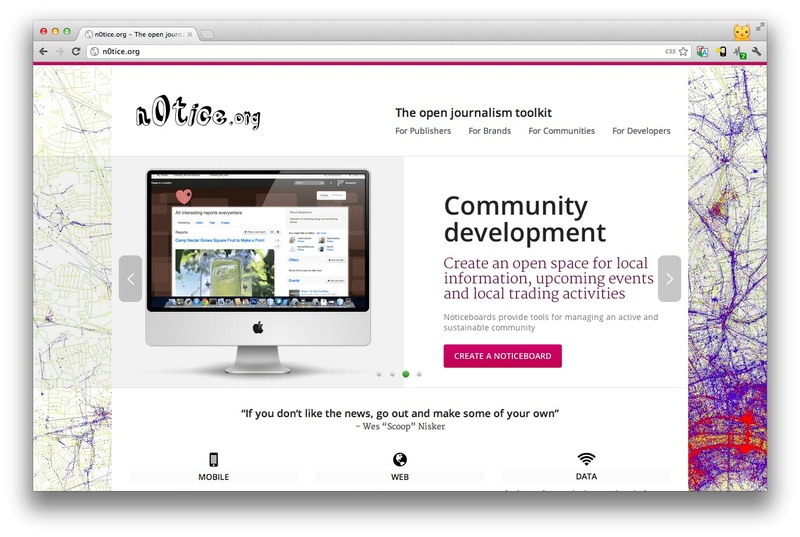 So, what does the new Open Journalism Toolkit offer? Hosted at n0tice.org, the product’s site highlights ways for different groups to put the tools on offer to use. For publishers and brands, features like crowdmapping, mobile publishing, liveblogging and collaboration are all on offer. Crowdmapping is the process of adding user-sourced data onto a map, an increasingly popular tactic for news organisations, and n0tice offers a step-by-step process to create a crowdmap with any type of data, quickly and easily. Publishers can also tap into n0tice to offer custom content feeds, content moderation features and more. Communities can use the toolkit to create their own version of n0tice specifically tailored for their specific needs. They can manage the look and feel of the site, who can publish to the noticeboard – and what they can publish. Finally, for developers, there’s an API available that allows them to hook into n0tice content and features to enhance their own apps and services. While n0tice is very much an experimental ‘intrapreneurial’ project within the Guardian and the toolkit is free to use, there is a business model based on geo-targeted ads behind it. Premium-position ads targeted at specific locales cost £1 per day. While this is a simple model that will probably mature with time, it can’t hurt the Guardian Media Group’s struggling bottom line to draw more publishers, users and developers into the n0tice universe – either via the standard service or this new toolkit. Next up for n0tice is an iPhone app, due very soon, but we’ll be watching closely to see how third-party adoption of the toolkit comes along.